Building a website can be difficult process - more so if you don't know the first thing about color theory, graphic design, or any other kind of aesthetics. Wix, known for its drag-and-drop website creator, wants to make making sites a snap using a new artificial intelligence - the first of its kind - that creates eye-catching webpages for you. Wix Artificial Design Intelligence, or ADI, can create a fully-functional website for free based on parameters set by the user's business, location, and other information gathered from a short questionnaire. Wix claims that any and every site made with Wix ADI is unique, with billions of possible combinations of pages, layouts, color schemes, fonts, and copy. From there, users can still tweak and build upon the AI's design until they have something tailored exclusively for them. 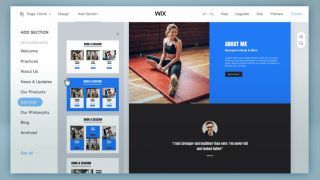 "Wix ADI is the world's first technology platform that combines website design and content creation with artificial intelligence to enable complete websites to be created in a matter of minutes," said Wix co-founder and CEO Avishai Abrahami. Abrahami added that Wix ADI allows small businesses to build webpages "easier and faster than ever," forgoing the need to know coding, structure, or design - something that could become a potential job hazard for professional web designers, should the technology prove as useful and unique as Wix claims. Wix ADI will roll out over the course of the coming months to users, so you may still have to hold on to your homebrew site a little longer. Just be sure to proofread the AI's work once it releases, in case a glitch decides your business website could use a little more Comic Sans.